Master technician Andy O’Grady delivers a friendly yet highly professional video presentation providing easy to understand explanations of the various aspects of work required when the vehicle was on the ramp at Birmingham’s Bristol Street Motors. Using visual tools such as the print out of the judder the car had been making, Andy explains the investigation undertaken and the findings, clearly outlining next steps. By methodically showing how the need for a new clutch was identified, the customer is far more likely to authorise the work required. Andy takes the owner on an informed ‘tour’ of the car highlighting work which needs to be undertaken showing exactly how conclusions were reached. This is balanced with areas which are given a clean bill of health. Andy’s approach is courteous, open and insightful which communicates honesty and transparency to the customer. Whilst the work required is not good news, it is delivered factually and with evidence using extensive visual aids enabling the customer to make an informed decision. Finally, Andy assures the customer that the service advisor will be in contact. All in all, this is a textbook example of how to deliver news no driver wants to hear, that work is required to keep their car in the best condition for the road. 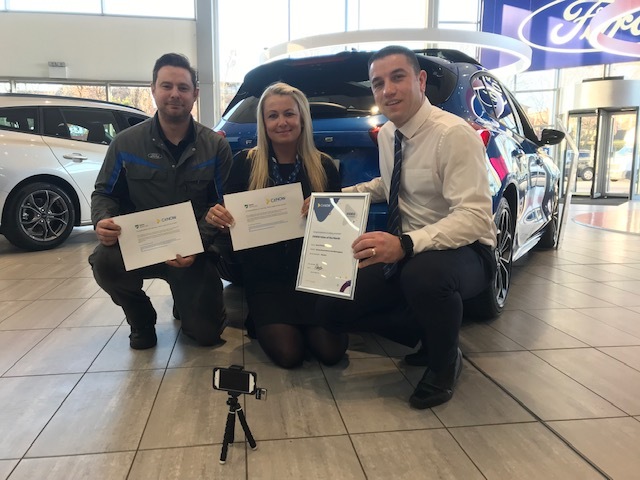 The video was so well presented despite the list of repairs required that it won an internal competition within the Vertu Motors Group.